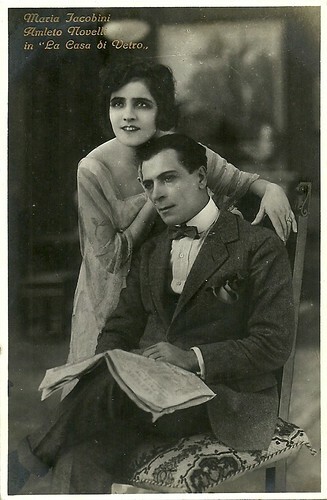 Maria Jacobiniand Amleto Novelli star in the Italian silent melodrama La casa di vetro/The glass house (Gennaro Righelli, 1920). G.B. Falci in Milan published the postcards. Italian postcard by G.B. Falci, Milano. Photo: publicity still for La casa di vetro/The glass house (Gennaro Righelli, 1920), starring Maria Jacobini and Amleto Novelli. Italian postcard by G.B. Falci, Milano. 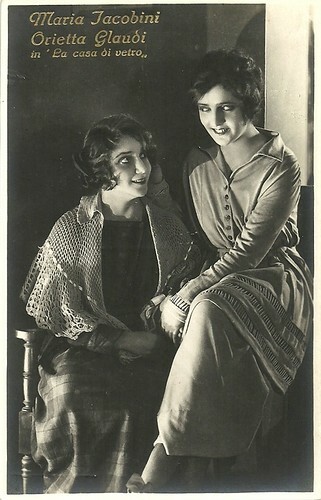 Photo: publicity still for La casa di vetro/The glass house (Gennaro Righelli, 1920), with Maria Jacobini and Orietta Claudi. Italian postcard. Caption on the back: 'Triste Natale' (Sad Christmas). Photo: Fert. 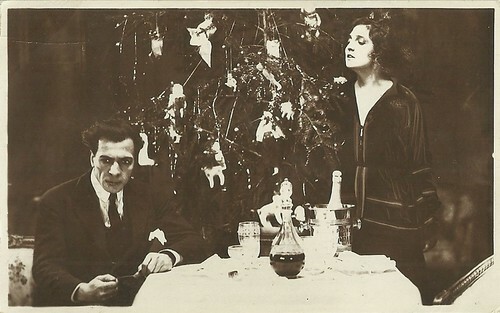 Publicity still for La casa di vetro/The glass house (Gennaro Righelli, 1920), starring Maria Jacobini and Amleto Novelli. Italian diva Maria Jacobini plays in La casa di vetro/The glass house (Gennaro Righelli 1920) the mundane city girl Gaby Printemps. During a trip, and accompanied by her good fried Max (Oreste Bilancia), Gaby is struck by the quiet life in a mountain village, and decides to remain there. She meets Roberto Landi (Amleto Novelli), a simple and honest young man, and the two fall in love, creating endless suffering for Roberto's fiancee Grazia (Orietta Claudi) and his parents. They move to the city, but their different life styles soon become evident. Moreover, jealous Max tries to split them. Roberto's father (Alfonso Cassini) decides to find his son and confronts him with the words that Gaby belongs to the species which one loves but not marries. In the end, Roberto admits his failure. At Christmas Eve he returns to the mountain village and reconciles with his old love Grazia and his parents. Gaby annihilates her memory by breaking a glass of champagne, as she says, "just like all glass houses do" (the title of the film). In the Italian journal La vita cinematografica, Dioniso thought that 'the glass house' was a misleading title, pretending transparency while several secrets are going on at Gaby's. And in the end no home is destroyed as both lovers were not really planning to build one. The broken glass only refers to Gaby's broken heart. Instead, Dioniso praised the shots on location in the Italian countryside, at the foot of the Majella mountains. Orietta Claudi had a relatively short career in Italian silent cinema of the early 1920s, mostly playing the young family girl opposite the mundane divas such as Pina Menichelli, Italia Almirante Manzini and Maria Jacobini. Scripted by Luciano Doria and future film director Nunzio Malasomma, La casa di vetro was produced by the Fert company of Turin and distributed by Pittaluga. Cinematography was by Tullio Chiarini. La casa di vetro had its Roman premiere on 21 February 1921. Italian postcard. Publicity still for La casa di vetro/The glass house (Gennaro Righelli, 1920), starring Maria Jacobini and Amleto Novelli. Italian postcard by G.B. Falci, Milano. Publicity still for La casa di vetro/The glass house (Gennaro Righelli, 1920), starring Maria Jacobini and Amleto Novelli. Italian postcard by G.B. Falci, Milano, no. 13. 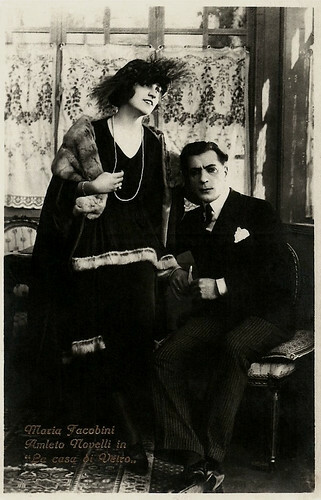 Publicity still for La casa di vetro/The glass house (Gennaro Righelli, 1920), starring Maria Jacobini and Amleto Novelli. Source: Vittorio Martinelli and Aldo Bernardini (Il Cinema Muto Italiano, Vol. 1920 - Italian) and IMDb.